The Ted Stevens Anchorage International Airport is an important gateway for both the city of Anchorage and the state of Alaska. It is found only 5 miles / 8 km from the center of the city and provides more than ten percent of the city's total employment. About five million passengers are handled at this international airport annually. There are two terminals serving passengers. The South Terminal is designed for domestic passengers, while international flights are handled at the North Terminal. All three runways are more than 2 miles / 3 km in length, which is a requirement for the heavy cargo planes that frequently take off and land at the airport. Alaskan Airlines is the major passenger carrier that uses the international facility as a hub. Other airlines operating from the terminals include Delta Air Lines, United Airlines, PenAir, Era Alaska and Air Canada. Flights between Seattle and Anchorage are served by Alaska Airlines and carry more than 700,000 passengers a year. The West International Airport Road is the main gateway into the airport. However, passengers should turn off at Minnesota Drive to reach the downtown area, passing by Spenard, Minnesota Park and the Westchester Lagoon. 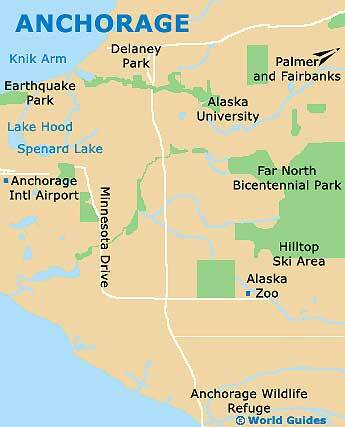 DeLong Lake, Lake Spenard and the Earthquake Park are all located in close proximity to the Ted Stevens International Airport. The facility is located to the southwest of the downtown and midtown areas of Anchorage, and to the northeast of Kincaid Park. The facility sits upon International Airport Drive, which is connected to the main road of Minnesota Drive. Whether passengers are looking to go to the southern reaches of Anchorage or the northern, downtown area, Minnesota Drive can take them there in less than 15 minutes. Parking is available on the complex and in good supply. The South Terminal (domestic) offers a short-term parking garage and a long-term lot, while the North Terminal (international) features a large short-term parking lot. No charges are made for the first 30 minutes of parking, regardless of location. A cell phone waiting lot is also provided outside of the Baggage Reclaim area, as well as a Park, Ride and Fly lot. Book your Anchorage Car Rental here. There are several different bus services for passengers. Transport between the terminals and the Park, Ride and Fly facility is offered by shuttles. The city provides a bus every 30 minutes to the airport, from the enormous Diamond Center shopping mall (East Diamond Boulevard / Old Seward Highway) and the downtown area. Other shuttle buses on offer include Alaska Shuttle and Eagle River Shuttle. A great way to get to and from the airport is by using a taxi. Prices for taxi journeys into the downtown area of Anchorage are quite reasonable. There are two companies offering taxi cab services, Checker Cab and Yellow Cab. Taxis gather around the Ground Transportation Island of the South Terminal (connected by the underground lobby and sidewalk) and along the curbside of the North Terminal, next to the main lobby. It usually takes about 15 to 20 minutes to reach the central district of Anchorage by taxi.